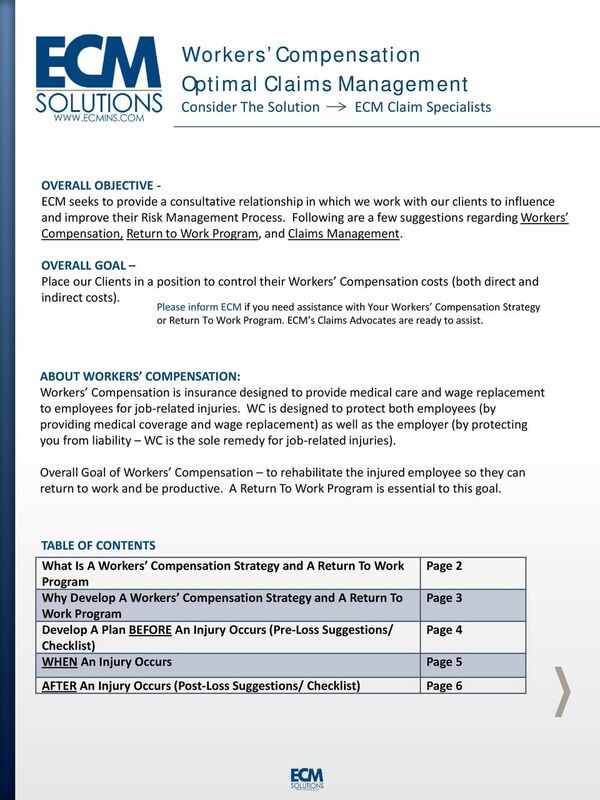 Download "Workers Compensation Optimal Claims Management"
4 DEVELOP A PLAN BEFORE AN INJURY OCCURS (Pre-Loss Suggestions / Checklist) Obtain a commitment from Senior Management for aggressive injury management and Return To Work Program. Establish clear program guidelines for managers, supervisors, and employees. Who, What, When, and How to report a workplace injury. Establish a central contact (make someone accountable) for handling the Safety Program, workplace injuries, and the Return To Work program. Central Contact will stay in contact with the employee, the insurance company adjuster, and the physician. Implement and Reinforce Regular Return To Work Program Planning. 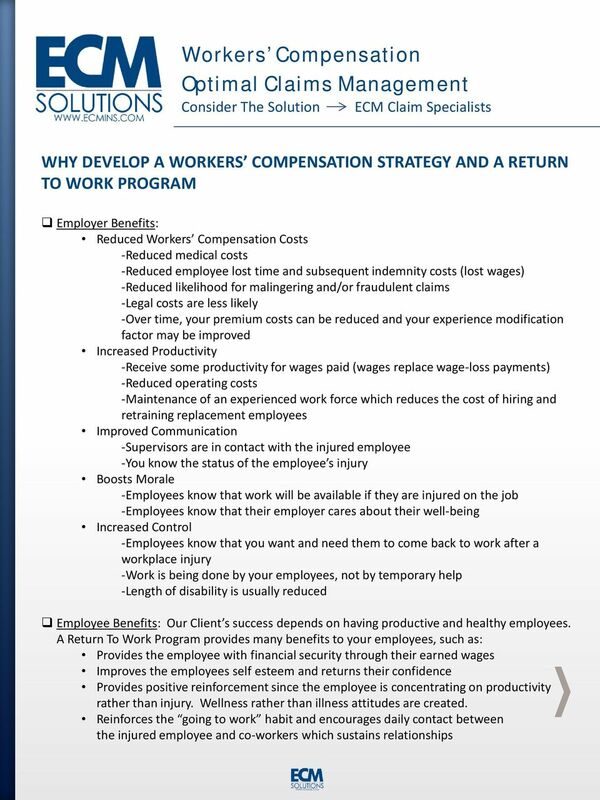 Address Workers Compensation and Return To Work program during new-hire orientation. Hold regular safety meetings. Display a Return To Work flyer where you post important employee information or notices. Develop a formal safety program and train your employees. Emphasize the importance of safety to prevent workplace injuries. Develop a Safety Incentive Program for your employees. Develop aggressive Hiring and Recruiting practices. Post-offer Physical Survey Note: You hire the whole person when hiring someone, whether or not they are healthy, or have a pre-existing injury. Note: Don t get stuck with the we never should ve hired him statement. Develop Job Descriptions. Develop Transitional Work, Modified Work, and Alternate Work Descriptions. Interview, Identify, and Partner with occupational clinics on your Return To Work program. Look for providers with occupational medicine experience. Build relationships with providers, and encourage clinic physicians to visit jobsites or your operation. Share your Return To Work Program, Job Descriptions, and available Transitional Duties with the physicians. Measure Return To Work Program results and efforts on a regular basis, and regularly communicate successes throughout all levels of the organization. 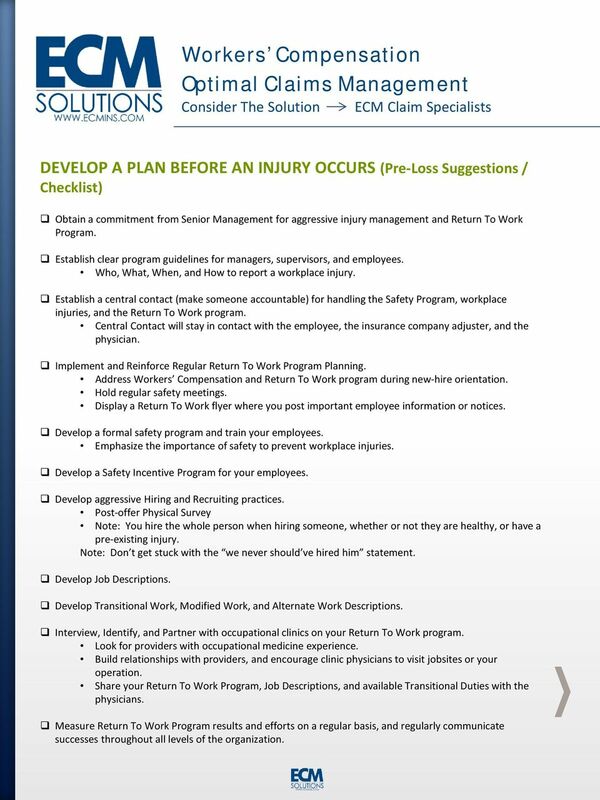 5 WHEN AN INJURY OCCURS Workers Compensation Key Element of Success An open flow of communication between the employer, the employee, the physician, and the claims adjuster. Immediately: Ensure that the injured employee receives medical attention, or that they sign an informal waiver that they refused medical treatment. Supervisor should go to medical facility with the employee. Ask treating physician to conduct a Drug and Alcohol Screening/Legal Screen, to determine if drugs or alcohol are in the employee s system Call or complete and submit a First Report of Injury to the Insurance Company (smaller claims may be submitted For Informational Purposes Only ) To do within the first 24 Hours of having an accident: Contact Edwards, Church & Muse, Inc s Claims Department to let them know an accident occurred. Initiate an accident Investigation Determine: Who, What, Where, When, & How. Write and save the names, addresses, telephone numbers, and Social Security Numbers of any witnesses. Gather and save all technical information and data surrounding the accident what equipment was the employee using, was the piece of equipment yours or a rental, was it the fault of another contractor. Save and secure all relevant pieces of equipment for future testing. To do within first 72 Hours after having an accident: Owner, Return To Work supervisor, or Superintendents and Project Managers should make contact (call and/or visit) with the employee to ensure that their needs are being taken care of and relay that you care about their well-being. Speak directly to the doctor to ensure that all the correct information has been given to them. Speak directly with the insurance company s claims adjuster to stay in the loop. Let doctor know transitional duty is available. Call police, highway patrol or any other responding agencies to receive copies of their reports. To do within 5 Days of having an accident: Owners and top Management should contact the employee to ensure that he is recovering. Offer assistance in any way possible. Call employee at home to ensure that they are healing and to see if they need anything else send a card, flowers or a note to let them know they are missed and to hurry back as soon as possible. 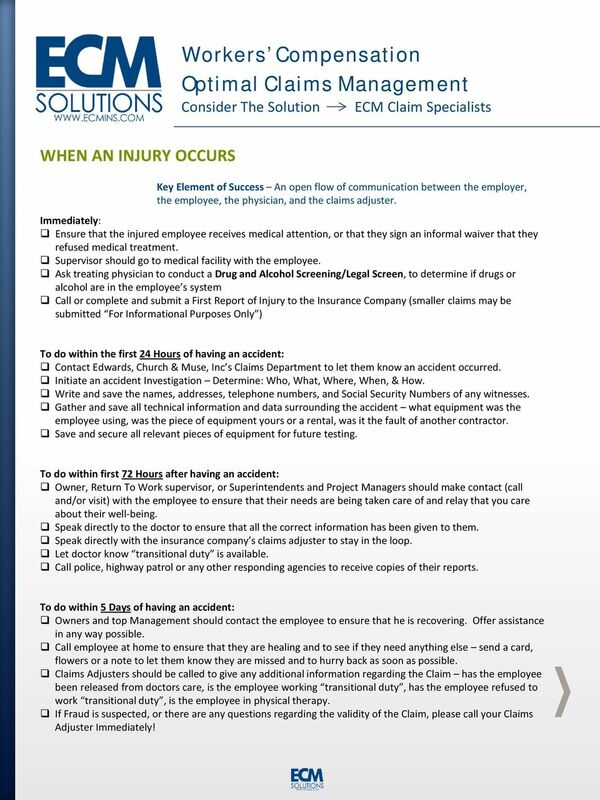 Claims Adjusters should be called to give any additional information regarding the Claim has the employee been released from doctors care, is the employee working transitional duty, has the employee refused to work transitional duty, is the employee in physical therapy. If Fraud is suspected, or there are any questions regarding the validity of the Claim, please call your Claims Adjuster Immediately! 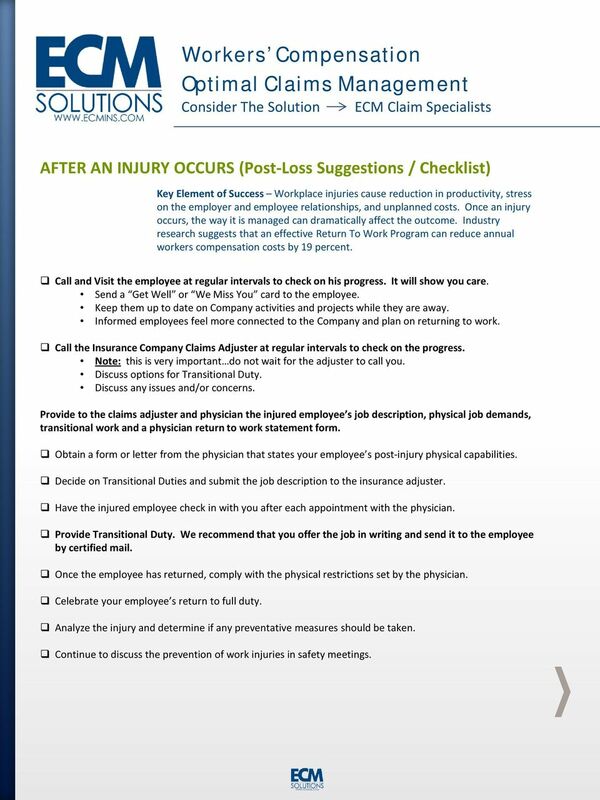 6 AFTER AN INJURY OCCURS (Post-Loss Suggestions / Checklist) Key Element of Success Workplace injuries cause reduction in productivity, stress on the employer and employee relationships, and unplanned costs. Once an injury occurs, the way it is managed can dramatically affect the outcome. 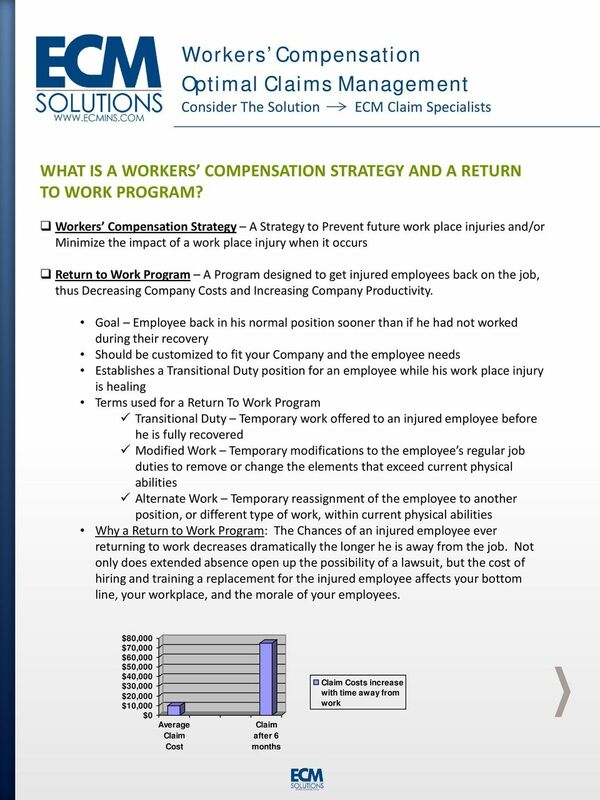 Industry research suggests that an effective Return To Work Program can reduce annual workers compensation costs by 19 percent. Call and Visit the employee at regular intervals to check on his progress. It will show you care. Send a Get Well or We Miss You card to the employee. Keep them up to date on Company activities and projects while they are away. Informed employees feel more connected to the Company and plan on returning to work. Call the Insurance Company Claims Adjuster at regular intervals to check on the progress. Note: this is very important do not wait for the adjuster to call you. Discuss options for Transitional Duty. Discuss any issues and/or concerns. Provide to the claims adjuster and physician the injured employee s job description, physical job demands, transitional work and a physician return to work statement form. Obtain a form or letter from the physician that states your employee s post-injury physical capabilities. Decide on Transitional Duties and submit the job description to the insurance adjuster. Have the injured employee check in with you after each appointment with the physician. Provide Transitional Duty. We recommend that you offer the job in writing and send it to the employee by certified mail. Once the employee has returned, comply with the physical restrictions set by the physician. Celebrate your employee s return to full duty. Analyze the injury and determine if any preventative measures should be taken. Continue to discuss the prevention of work injuries in safety meetings. Accident Investigation Protocol This Protocol is inserted for example only. An accident investigation is usually completed by NELCO' Workers Compensation Section as a service to our Clients via telephone.